Just how do studio monitors work? A good pair of studio monitors are one of the most important parts of your studio setup, and can have a huge effect on the quality and end result of your productions. I think that without decent monitors, you’ll never get a true and honest picture of the music you’re creating. Monitors are different compared to consumer-level loudspeakers that you would connect to your home hi-fi system. These hi-fi speakers that you use to listen to your CDs and MP3s actually ‘color’ the sound that you hear, as they tend to emphasize certain frequencies to give you a better listening experience. This usually means that the low-end and high-end frequencies will be accented and boosted slightly, a feature that we really don’t want to have in our studio monitors. They have a flat frequency response, meaning all frequencies are outputted equally and nothing is boosted or cut. This means that what you hear is a true representation of what your mix and production sounds like. They are built more robustly to cope with the demands of the studio. You’ll see this in both the physical construction (tough and sturdy housing for the speakers) and the strength of the speaker cones. Some producers I know may be working on a bass sound for a few hours straight, playing the same phrase over and over again to get it right. The speakers need to be able to withstand this sort of constant low-frequency work. There are a few different possible setups when it comes to monitoring in the studio, one of which you should follow in your own setup. Far-Field Monitoring: this setup is usually found in commercial studios, due to their larger size and ability to cope with louder volumes. The monitors are normally found a few feet behind the mixing desk, mounted into the acoustically-designed walls. Near-Field Monitoring: this is the setup I use and that you’ll want for your own studio. The near-field monitors are usually placed around one-two meters away from your position behind the mixing desk or your computer (where you’ll be recording and mixing with your DAW). The two monitors are angled so the sound is directed towards your head. Because they are close to you, the sound is pretty direct and isn’t affected too much by the sound of the room. The monitors should ideally be placed on their own dedicated monitor stands, which helps prevent them from vibrating the surrounding areas that they’re in contact with. Also, try to avoid placing the monitors on flat surfaces as this can result in comb-filtering, which won’t give you an accurate picture of what you are playing. Subwoofer: a subwoofer is a specially designed monitor, placed on the floor (usually under the desk and in between your two monitors) and responsible for outputting bass frequencies. The exact frequencies reproduced can vary from monitor to monitor, but is usually around the 20-200 HZ range. It’s not a necessity to have a subwoofer and it’s a bit of an extravagance, but if you produce music that will mainly be played in clubs, then you might want to consider using one. 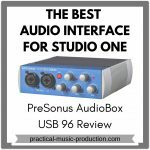 These two terms refer to whether the studio monitors contain their own amplifiers or whether they require a dedicated external amplifier to power them. Passive: these monitors don’t have their own inbuilt amplifiers, so they require an external amplifier to power them. This means you have an extra expense where you have to purchase another piece of equipment. Active: these monitors are powered by their own amplifiers enclosed in the monitor’s casing, so there’s no need to purchase an extra amplifier to do the job. 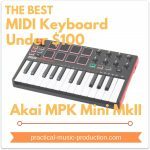 This can cut down on the cost of setting up your studio and is also a lot more convenient and simple to connect and configure. I always recommend getting active monitors as these are the type I always use. We started this article with one question – how do studio monitors work? 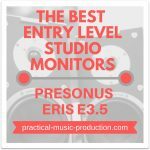 Hopefully you can now see how the design and the type of monitor can have a big effect on the sound you achieve in your home studio. When it comes to getting your own studio monitors, I definitely think it’s worth getting active, near-field monitors. 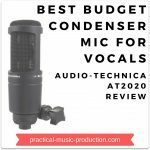 They’ll help you to monitor and mix at relatively modest volumes, but will still provide a flat, clean, and accurate sound which can only serve to improve your mixes and productions.